A modern classic, a high gloss, white kitchen always delivers on style. This bespoke version takes style to the next level with handcrafted curved doors and carefully detailed finishing. You can demonstrate your cookery skills in style on this central cooking island while the family watches on from the generous breakfast bar. A white kitchen is ideal for creating stark contrasts with the colours and accessories you choose. It is literally a blank canvas! A spacious kitchen like this is perfect for playing the host at dinner parties. If you’ve been looking for a new kitchen but haven’t been sure where to start, then why not begin with Starplan? 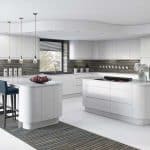 We can guide you through every part of a new fitted kitchen, from the design process all the way through to installation. We want you to be able to call your kitchen the heart of your home with pride. After all, you’re likely to be spending a lot of time in there! 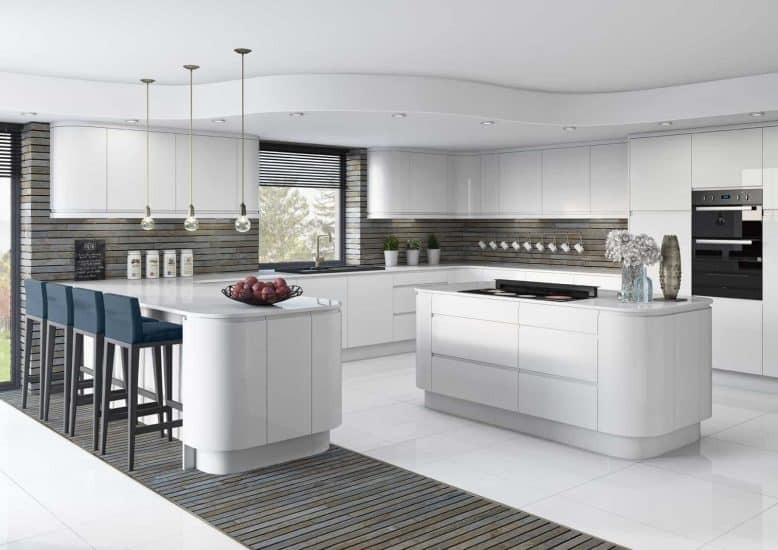 You’ll soon become the envy of all your friends with a new fitted kitchen from us.